Complete relative value system established by surveys of physicians in all specialties, nationwide. A full spectrum of CPT codes are valued, not just those developed for Medicare, allowing for the development of a complete fee schedule and provides a methodology for measuring productivity. 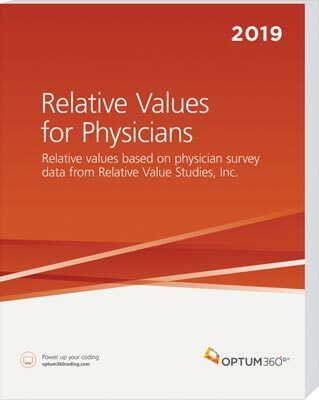 Relative Values for Physicians is a complete relative value system established by national surveys of physicians in all specialties. With this tool you can establish, defend, and negotiate fees for medical and surgical procedures with the same relative values used by many insurance companies. Relative value scale is based on physician survey data. Relative values developed with actual physician input. Easy, step-by-step instructions for practice management. Set your fees, analyze contracts, and perform cost, profitability, and productivity analyses.